Lying west of Mull in the Inner Hebrides, these two islands, separated by a narrow strait, are quite different in character. Once populous, Coll was almost completely stripped of people in the infamous clearances and today has a population of 200 souls. 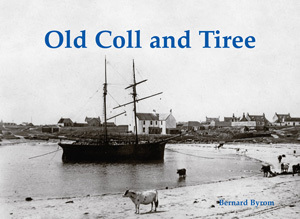 In this illustrated history there are ships at Arinagour’s piers and pictures of blackhouses and the island’s castles. The photos of Tiree again mainly feature the coast and the sea but also include churches, the mill, the post office, the school, Highland coos and the burning of kelp as well as a bare Tiree Airport.